Headin’ (back) to Hollywood for a little bit! I’m going out to Hollywood for a few months to attach myself to some motion picture projects now that the writer’s strike is over. I’ve been planning a trip for a while now and the time is right. I love going to visit California and it should be a fun time both work related and non work related. I’m looking forward to riding some ATV and dirt bikes in the desert! I’ll be back in North Carolina soon if all goes as planned and am keeping it as my home base. 1- I just finished “The Secret Life of bees” for Fox Searchlight Pictures. I’ll post art from it as I get clearances. 2- I just finished some concept illustration for my friends at Design Reactor. They are great guys and I had fun on that project. I look forward to doing more with them in the future! 3- I’m starting a new indy horror film in March called “Depravity” with my good friends at Waterline Entertainment and Dripping Dead Films. Can’t wait to get started! I’m posting a new piece of artwork. 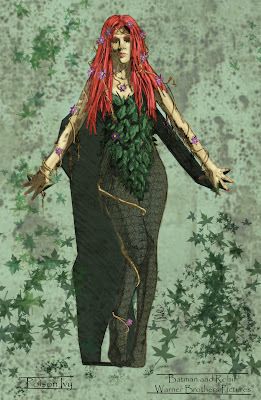 This one a concept illustration of “Poison Ivy” from Batman and Robin. Hope you enjoy! I’ll post more later from the road!